This entry was posted in Computers by Chad Upton. Bookmark the permalink. There must be a way to turn this off – surely the machine should be able to offer better performance with a 65w PS than with the battery alone. 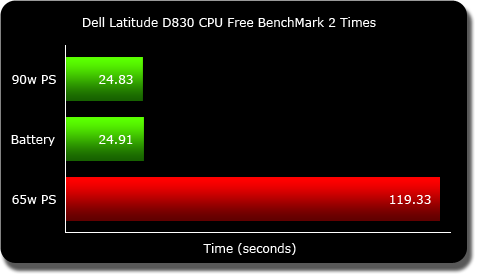 I would have thought so, but that’s why I wanted to run these benchmarks. If the battery can output more than the 65w power supply then maybe the answer is no, the 65w power supply is not enough power for full performance. Went on holiday with my D830 and a 65W PSU. H264 video from my video cameara would not play no matter what. Yesterday had the same issue while trying to play MKVs with VLC – choppy and all. Using a 90W PSU fixed everything. I can confirm that. I didn’t do a benchmark, but my Dell E6420 with 65W power supply is awfully slow (sluggish desktop). Connecting a proper power supply immediately brings performance back to normal. Bottom line: don’t use a 65W power supply if your Dell computer needs a 90W one. You are massively losing performance. Will using a 90 w power supply on a computer that only needs a 65 W damage the computer? No. The wattage can be higher, but not the voltage.